Potato in a skin to boil, give to him to get cold, clean, cut on two or four parts (depending on the sizes of tubers), to put in a salad-dish, add salt, black ground pepper, to sprinkle with the finely shredded bow, to pour vegetable oil, sour cream or mayonnaise. 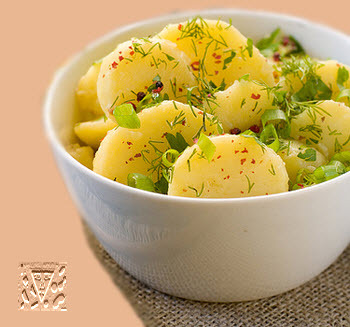 Potato boiled - 100 g, bulb onion - 15 g, oil vegetable - 15-20 g, sour cream or mayonnaise - a 30 g, salt, pepper. To boil a potato, clean from a skin and cut shallow blocks. Then in a deep vessel to mix him with the finely cut onions, boiled egg and prunes without stones. To add the also cut greenery of dill, mayonnaise, salt, pepper, all of it to mix and put on a cold. After it to put in a salad-bowl. On a 1 portion: boiled potato - a 80 g, onions - a 20 g, prunes - a 30 g, .mayonnaise - a 40 g, an egg is 1/2 th., other to liking.